San Francisco Treats (Part II), here. No, MM, I don’t think it is frivolous at all to haul goodies like this across the globe for a few moment’s pleasure. We love all sorts of cheeses in our household, and usually, the more pungent the better … Our latest craze is taleggio. M-mmm, so good with quince or guava jam. so walang tao dito…wala pang naguunahang taga komento…wari koy abala sa pagluluto at karamihay nasa sementeryo upang bisitahin ang mga yumaong mahal sa buhay…at ako eto nagbabasa ng blog ni MM at naiinggit sa sarap ng kanyang dalang tinapay at keso mula sa ibayong dagat….tunay na napakataas ng panlasa ni market man…nahiya tuloy akong mag alok ng bonete at kesong puti mula sa aking probinsya ng laguna….at baka pangatihan si MM kakahiya naman…baka hindi sanay ang bituka nya sa mga ito!!! hehhehe just kiddn MM kaingget ka naman sarap ng blue cheeze …teka maransak nga ang ref ng aking propesora nun college…advocate at practitioner un sustainable agriculture at organic farming….so nasa cebu ka now MM? pasalubong naman jan!!! hehhehe!!!! may tanim kaba na biasong MM? nakabili ako sa propesor ko dati eh…itatanim ko palang gudlak at matagal pa cya bago mamunga hehhehe! I see she hit the Cowgirl Creamery cheese shop, usually my first stop in the Ferry Building. Did she also have the than long (sp?) crabs while she was in SF? I always love visiting San Francisco, although there’s a bit of residual ambivalence about living there full time since I have way too many relatives already there. But it’s a food lovers paradise for sure. We just came back from driving the coastal tows of California concentrating on the Big Sur and including SF, Sonoma, and Napa. Just like you, our 21″ inch carry-on were full of goodies. Love, love the Sat. Ferry Market…….Miette macarons (not as good as PH, but close), Blue Bottle Coffee, Pork Deli, Slanted Door (Vietnamese rest. ), artisan/organic produce, various cheese, olive oil, custom jewelry and to die-for porchetta sandwich by Roti Roli (http://eatingasia.typepad.com/eatingasia/2007/05/road_roaster.html). Amazing that after a 5 1/2-hr. flight, the pork skin of the sandwich was still crunchy! In SF, you should also try the famous Mitchelle Creamery (owned by a Fil.) esp. their young coconut and lukuma (a Peruvian fruit) and the Bi-Rite Creamery (caramel salt, balsamic strawberry, honey lavander, etc.). Across Bi-Rite is a very good rest., Delfina, that serves delicious fried sardines and chocolate torte (topped with cocoa nips) served with olive oil gelato sprinkled with Meldon salt, among others…yummy! As am sure you’re familiar with the Napa Valley/Sonoma restaurants, you might want to also try Healdsburg……Cyrus and Downtown Bakery (vulcan bread, bruschetta, sticky bun). Hubby adores cheese and does not fail to pick up strange looking variety. Somehow every grocery day, he goes straight, as if an unseen force pulls him, to the chocolates section and the cheese display. He gets excited when the cheese is on special â€“ half price always. Like a boy in Leggo toy section â€œI have not tasted this, shall we try?â€ A baguette or plain crackers, blue cheese or brie and Cadbury milk chocolate are always on our shopping list. Australia benefited from the cheese making skills of Greek and Italian migrants who introduced European style cheese making in Australia. El_jefe, my husbandâ€™s family is from Laguna and he longs for kesong puti from Sta. Cruz all the time. 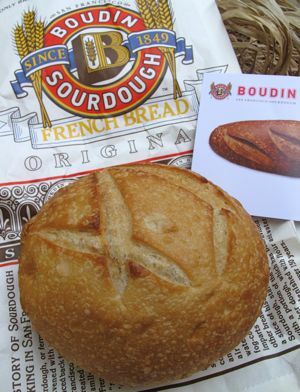 I love Boudin Sourdough bread!!! I use to bring back a carload of sourdough for friends and family whenever I drive up to SF… then my wish finally came true about 2 years ago! They opened a branch 10 minutes away from my place! Hmmmm…. I think I’ll have lunch there tomorrow… clam chowder on a sourdough bowl!! What day did Mrs. MM go to Ferry Building? Hopefully it was a Saturday, when the Farmer’s Market was on. I would normally go early saturday morning. Have my cup of java from the Blue Bottle Coffee cart at the side of the ferry building, then head back of building and go thru the farmers market, then enter the building thru Sur La Table, head to Cowgirl Creamery for cheese and Acme Bread for Sourdough and then head back out to the boardwalk and have lunch looking out the bay. Head back in for some Recchiuti Chocolates and then some afternoon tea at Imperial Tea Court. Walk around the other stores till around its time for some cocktails at Tsar Nicoulai Caviar. Napa valley is nice but I’d ask people to try Wente Vineyard here in my neighborhood though, Tri-Valley Area, a guilty pleasure (they usually have very intimate concerts of famous singers or bands, ie. Barbara Streissand, BB King, etc..as in very intimate right in their vineyard restaurant. Wow, cheese from Cowgirl Creamery. I’ve only read about this artisan cheese maker from Fine Cooking magazine. How was it? I’m rather late to the cheese appreciation game, but have been delighted by my discovery of fig mustard. Do you have this pairing at home, Marketman? It’s brilliant, made me truly appreciate cheeses more. Diday its hard to find authentic quezong puti these days….most quesong puti manufacturers in sta cruz adulterate their kesos with plenty of gata and ”bahay asim” ng baka…so be wary of knock offs I think the best puting kesos comes from lumban in and sta. cruz…kesong puti to me tastes like tofu and lacks the sharp creamy flavor of cheezes …sometimes quezong puti smells like unwashed armpits…hehe….but…but! kesong puti blends well with bonete and pandesal, in salads, ”tuyo” pasta, pinoy pizza and it is best grilled too with tortillas and pesto! yum!!! taga san ka dito sa pinas diday? cheese from cowgirl creamery. by far one of my favorites. You have to go to Tartine Bakery in the Mission. Yes, the Ferry Building on Saturday is the Mecca of fine food. Don’t miss Recchiuti chocolates. Exquisite. I am very fortunate to live in the SF bay area. Soon to open, a large organic market at Jack London Square in Oakland, a straight ferry ride away from the the Ferry landing, where they recently held the Real Food Festival. sfo is my all-time favorite city! and yes, whenever members of our family travel abroad, our luggage is full of food. even a trip to hk is not complete without a visit to the cheese section of city super. SF the mother lode of earth friendly good eats from organic fresh produce to free range fowls and happy cows. Hopefully Mrs. MM enjoyed the obscenely diverse food scene in the Bay Area. It’s a good thing. Love all your pasalubongs : ) thanks for sharing. thanks for sharing the pasalubong from Mrs MM, now i know what to check when i visit SF. el_jefe, I am from Cebu and my husband is from Quezon City. His motherâ€™s family is from San Pablo and fatherâ€™s family from Sta. Cruz. My in-laws also love fried kesong puti. MM, as soon as I saw San Francisco and goat cheese i already pictured the ferry building. For a year, I commuted using the ferry from SF to Vallejo. Always stopped to get my bread and some cheeses. That commute was always so picturesque and made me thankful that I lived in the bay area. By the way, there is also a good Vietnamese and caviar restaurant in the building. Thanks so much for sharing your travels Mrs. MM! The picture of the Mt. 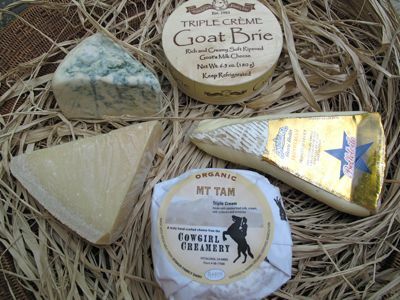 Tam cheese made me salivate! If ever back in CA try the Cypress Grove cheeses. Their Humboldt Fog is delicious. And if you’ve never been to a Trader Joe’s, goooo (if only they would build one in Manila I’d be a very content Californian living in Manila)! They have a good selection of decent cheeses at very thrifty prices. Not maybe up to par with what you’ve pictured above but decent and at a fraction of the price. Marketman, unless you have never been to Napa before, I’d suggest skipping Napa altogether and exploring other wine regions that are less Disneyfied. Try Sonoma, Mendocino, or Santa Cruz to start. Just 2 cents’ worth from a serious wine aficionado. @kurzhaar , Mendocino hehehehe, isn’t it legal to plant and sell weed over there, for medicinal purposes? ;) hehehehehe uhmmm.. we have grapes here in Mendocino, purple grapes anyone?…. I got graaaaappppeees! (Hyphy) hehehehe. I love trying out different kinds of cheeses although I limit my intake of them because of lactose intolerance. I live just 5 minutes away from the origin of Jarlsberg cheese and we always have at least 3 varieties of cheese at home…I was just wondering, did the cheeses travel well and how many days can they be stored in the fridge or does one have to eat them right away? Ang gustong pasalubong ng pamilya ko d’yan sa Pilipinas ay keso or nakikipadala ako sa mga kaibigan na umuuwi. Anong keso ang magandang dalhin d’yan sa Pilipinas? Hindi nila nagustuhan ang lasa nu’ng puting coating ng brie; ayaw nila ng kesong amoy ut-t (hihihihi) daw, ayaw nila ng mumurahin (merong kayang ganoon? ); ayaw din nila ng Camembert; walang pumansin sa Norwegian brown cheese; kadiri daw ‘yung amag ng blue cheese; at bakit daw matigas ‘yung cheddar—ayokong magpadala o magpasalubong ng kesong hindi naman kakainin o mabubulok lang dahil may kamahalan silang taglay. I mean, anong keso ang kasundo ng panlasa ng Pinoy? I’ve been once to the French Laundry. Fabulous experience! But I love wine, and as there are many good eating opportunities in the Bay area (not all of them fancy restaurants, either), not to speak of the cooking opportunities, I personally pass on Napa as the rest of the “Napa experience” isn’t particularly to my taste. I’d at least recommend cheese and oysters out on Point Reyes, fresh fruit up in the Anderson Valley, and wine from the aforementioned regions. If you do go to Napa, check out the Mayacamas area. Thank you very much for the tip…I’ll keep that in mind.